On Wings of Eagles: God Can Use Your Talent. God Can Use Your Talent. Bob Russell who preaches in Louisville was raised on a farm in Pennsylvania and he tells the story of his first youth minister who was a city-boy. Now his youth group was made up mostly of kids from the farm so they didn’t think they would have much in common with this city slicker and so weren’t much ready to listen to him. The entire youth group was at Bob’s one Saturday and it came time to milk the cows. This youth minister said, "Can I go down to the barn with you and see what it’s all about?" Bob said, "Sure," and Harry Orn, the new minister, headed with the others to the barn. What the youth group didn’t know was that Harry had worked each summer on his grandfather’s dairy farm. 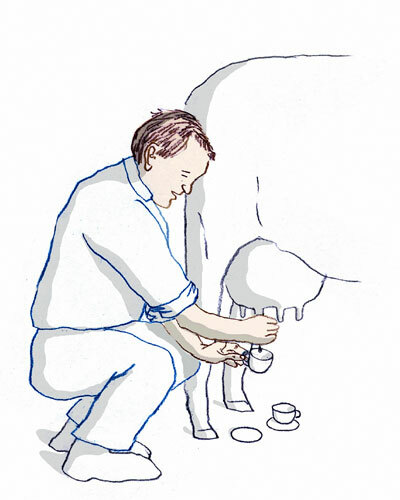 Well, Harry watched the milking for a little bit and then sheepishly said, "Could I try that?" Bob said, they welcomed the idea because they knew that it would be good for a laugh. So he sat down tentatively on the stool and he grabbed the cow in the appropriate place and 2 or 3 of the boys leaned way over to get a good laugh when this city slicker couldn’t get any milk out of the cow. And Bob says, "He suddenly turned that cow’s spicket right up at us and squirted us right across the face." Everybody thought it was hilarious. And you know what? He was an instant hit. Well, Bob says, maybe not instant, it took a couple of minutes, but Harry Orn was able to fit right in with the kids and had a great ministry. Listen, God can use any talent that you have, even milking cows. 18 And I tell you that you are Peter, and on this rock I will build my church, and the gates of Hades will not overcome it. 19 I will give you the keys of the kingdom of heaven; whatever you bind on earth will be bound in heaven, and whatever you loose on earth will be loosed in heaven.” 20 Then he ordered his disciples not to tell anyone that he was the Messiah. Dear Lord we are thankful for the many lessons you bring us through each day. We thank you that we can use these experiences to become more like you. In Jesus’ name, amen. I Wonder If I Should Have Listened? Do We Believe When we Pray? Lesson From A Million Frogs. Lesson From a Tootsie Roll Pop. Spare Wheel or Steering Wheel? Lessons From I Corinthians 13. Showing Love Makes a DIfference. Showing Love to The Least of These. Showing Love to Those Around Us. Love the Divorce Out of Them. The Biplane and the Father's Love. Are You A Leader of God's Pack? Are You A Super Bowl Christian? The Quarterback and His Testimony. Tom Brady was Ready, Are You?